Your message has been sent to Hemarsh Technologies . Like authorSTREAM? Give us a +1! 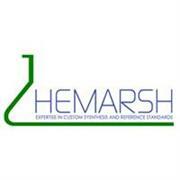 Hemarsh Technologies was established in 2008 and since then our company has enjoyed a rapid growth. Our prime focus is on contract research and impurities synthesis for pharmaceutical industries. We provide well characterized reference standards essential to ensure accuracy and validity of analytical methods used with-in the pharmaceutical industry.